Greenhouse Gardening - Growing plants, flower and vegetables under glass. Few gardeners do not at some time or another have an urge to grow plants in a greenhouse. It extends the range of plants that can be grown so that those too tender for our winter climate can be cultivated and it is a branch of gardening that can be enjoyed whatever the weather. Before purchasing a greenhouse you should decide what plants you wish to grow and choose a design which is suitable for them. For instance, if you wish to grow mainly tomatoes in the summer and lettuce in the winter you could well choose a greenhouse glazed almost to the ground as both these crops need maximum light and they benefit from the extra glazing. If you are mainly interested in growing pot plants the greenhouse could have partly glazed side walls, the lower half being of wood or brick with staging for the plants level with the side walls. It is also possible to have a greenhouse glazed to the ground on one side and with a low wall on the other side to enable plants to be grown in a border on the glazed side and pot plants on the staging on the other side. Heating Before a heating system is installed you should give careful thought not only to its initial cost but also to how much it will cost each year to maintain the desired minimum winter temperature. As a rough guide, to heat a greenhouse to a minimum temperature of 50°F (10°C) will cost twice as much as one heated to 45°F (7°C); three times as much for a temperature of 55°F (13°C) and four times as much for a temperature of 60°F (16°C). Management In a greenhouse you are able to control the ‘climate’ to a great extent and provide the most desirable conditions for the type of plants being grown. You do this by providing a suitable temperature, ventilation, moisture and shade as and when required. Without a heating system a greenhouse can be difficult to manage, particularly in the winter. Damp, stuffy conditions must be avoided when temperatures are low and the roof ventilators should be opened whenever possible. Watering should be done very sparingly and it is better to keep the soil slightly dry rather than wet. A heating system is of value not only in maintaining the desired temperatures but also in preventing excessively damp conditions from developing, particularly when the weather is very damp. For instance, in early autumn, when the air is often very damp at night, a little heat with some roof ventilation will help to overcome the dampness. In hot weather in the summer the situation is reversed. To prevent temperatures rising too high inside the greenhouse the ventilators should be opened fully and some shade given with blinds or a special distemper applied to the outside of the greenhouse. In addition, water is sprayed on the floors and stagings to create a humid atmosphere around the plants—hot and dry conditions encourage red spider mites and plants lose moisture too rapidly. Watering should be done freely, particularly with plants that have well filled their pots with roots. Soil composts To grow plants well they need good soil. This is not simply ordinary soil from the garden ; it should consist of a mixture of fibrous soil—preferably obtained from decaying turves—moist granulated peat and coarse sand with fertilizers added. The John Innes Seed and Potting Composts have been scientifically devized for the cultivation of plants under glass and, made up strictly according to the formulae, they give very good results. Soilless composts are being used more extensively these days since they do away with the need for sterilizing the loam and their value does not depend upon the quality of the loam as does the value of soil composts. Hygiene Pests and diseases spread very rapidly in the warmth of a greenhouse and a careful watch should be kept for the first signs of their presence. Fortunately many can be controlled effectively by using insecticidal or fungicidal smokes and sprays. Growing plants in the same border of soil year after year brings problems, and root diseases can set in. Sterilizing the soil with steam is effective in combating these disorders but, in a small greenhouse, steaming a large quantity of soil is hardly practical. One way out of the problem is to grow tomatoes, for example, on the ring culture system. The plants are grown in bottomless pots stood on a base of coarse weathered ashes. Seedlings are very vulnerable to soil-borne diseases and for seed and potting composts it is well worthwhile sterilizing the soil before mixing the other ingredients of the compost. Should diseases, such as damping-off, appear among seedlings, Cheshunt Compound will help to arrest the disease. Having done all one can to provide ‘clean’ potting soil, pots and boxes should also be washed whenever possible and dipped in a good disinfectant. This also applies to the interior of the greenhouse. Once a year all the wood and glass should be scrubbed down with disinfectant. The outside of the greenhouse should also be washed, particularly in industrial areas, as soot and grime can exclude light. Unheated greenhouses What can be grown in a greenhouse depends on the minimum temperature that can be maintained in the winter. A great deal of interest can, however, be had from a greenhouse with no heating equipment and if you are working to a small budget an arrangement of this sort is a good beginning; heating equipment can be installed later on as you become more experienced and wish to experiment with a wider range of plants. An attractive display can be had in an unheated greenhouse by growing mainly hardy plants in pots. These will flower a little earlier than those in the open but the flowers will not be spoilt by inclement weather. Other plants that are usually started into growth early in warmth for summer flowering, can also be grown by starting them later when outside temperatures are higher. Shrubs The camellia is often thought to be tender, possibly because the flowers, which appear early in the year, are sometimes damaged by frost. For this reason the protection of a greenhouse is valuable. All the varieties of Camellia japonica will grow happily in pots of lime-free soil, but they should not be cossetted as if they were hot house plants. Prunus triloba flore pleno has double pink flowers and is another fine flowering shrub for the cold greenhouse. The yellow-flowered forsythia and rosy-purple Rhododendron praecox, lilacs as well as winter-flowering heathers (Erica carnea) will all give a bright display. For flowering in the summer Hydrangea paniculata grandiflora produces enormous white flower trusses. It is easily grown in pots and the stems should be cut back severely each spring. The `hortensia’ hydrangeas will flower earlier than the species mentioned above and really good blue flowers can be had if the soil is treated with a blueing powder. Bulbs These can provide a wonderful display in the year. The earliest to flower are ‘prepared’ daffodils in January followed by ‘Paper White’ narcissi, the dark blue Iris reticulate and named varieties of snowdrop. Other small bulbs well worth growing are miniature daffodils, such as Narcissus cyclamineus, N. bulbocodium and N. triandrus albus, winter-flowering crocuses and Eranthis hyemalis, the winter aconite with buttercup-yellow flowers. For flowering in the summer, lilies such as L. auratum and L. speciosum look superb grown in pots. Gloxinias and tuberous-rooted begonias are popular plants and the tubers of these can be started into growth in early April. Other flowers for a spring display, which can be purchased or lifted from the open garden in the autumn and potted up for the cold greenhouse, are wallflowers, dicentras, astilbes, forget-me-nots, polyanthus, lily-of-the-valley and Christmas roses (Helleborus niger). Fruit and vegetables Even in a cold greenhouse, grapes will succeed but it is important to choose suitable varieties such as ‘Black Hamburgh’ or ‘Foster’s Seedling’. The vines can be grown in large pots or tubs with the stems trained up a supporting framework, or they can be planted permanently in a border of good soil. To have tomatoes fruiting under glass in June the seed has to be sown soon after Christmas in a hot house. They can also be grown in an unheated greenhouse but fruit will not be ripe until late summer. Young plants can be purchased for setting out in a border at the end of April. There is no reason why melons and cucumbers should not be grown in a greenhouse without artificial heat. As with tomatoes, early fruits cannot be expected but all the same they taste much better when picked fresh from one’s own garden. Peach trees can be grown in the open garden but they flower early in the year and their blossoms are likely to be damaged by spring frosts. Given the protection of a greenhouse this hazard can be avoided. Peaches make luxuriant growth and they can easily ‘swamp’ a greenhouse. For this reason they should be grown as fan-trained trees with all the stems neatly trained out up the roof or against one end of the greenhouse. Good varieties for a cold greenhouse are `Peregrine’ and ‘Duke of York’. Where there is a vacant border of soil in an unheated greenhouse during the winter, lettuce can be grown. Seed may be sown in October, and will produce seedlings ready for planting in November or December, and they should be fit for cutting in April and May. It must not be thought that all these flowers, fruits and vegetables can be grown together in a small greenhouse. If you prefer flowers it is best to grow little else although a vine or a peach tree could be grown with them. Tomatoes do not like heavy shade and so it would be unwise to have a vine, which produces a heavy coverage of foliage in the summer, with them. Cucumbers and tomatoes should also be kept separate for the best results. Tomatoes like plenty of light and air in hot weather, whereas cucumbers like tropical conditions—heavy shade, high temperatures and high humidity. Cool greenhouses Although great interest can be had from an unheated greenhouse a wider range of plants can be grown and earlier fruit and vegetables can be had if the greenhouse has a minimum winter temperature of 50cF (10°C). With the aid of artificial heat it is also easier to maintain a good growing atmosphere or climate for the plants. Shrubs As in the cold greenhouse, hardy shrubs such as forsythia and Prunus triloba can be brought into the greenhouse in winter for flowering much earlier than those in the open. Camellias will thrive, provided the temperature is not allowed to shoot up too high in the day—this causes the flower buds to drop—and hydrangeas in pots can be made to flower early. Indian azaleas are popular florists’ pot plants. These can be kept from year to year in a heated greenhouse, provided they are fed regularly. They flower in winter and early spring and can be put outside for the summer. Acacia dealbata, or mimosa, with yellow fluffy flowers and a heady scent can be enjoyed in early spring. There are also a great many ornamental climbers that will enjoy the warmth. The passion flowers, the brightly colored bougainvilleas, the soft blue Plumbago capensis and Lapageria rosea with rose pink, waxy bells, all flower in summer. BulbsAll the popular bulbs such as daffodils, hyacinths and tulips, can be made to flower in the dark days of winter in a heated greenhouse, but after the pots and bowls are removed from the plunge beds they should be given cool conditions at first and gradually acclimatized to warmer conditions. Hippeastrums, often mistakenly called amaryllis, have large, handsome flowers and the bulbs may be started into growth in February for spring flowering. Freesia corms, started into growth in August, produce their colorful and scented flowers in February and March ; they will grow well in a minimum temperature of 40°F (4°C). Arum lilies are not true bulbs—they have tuberous roots—but in a heated greenhouse they will flower in the spring. An easily grown and handsome bulb is the Scarborough Lily, Vallota speciosa. It can be stood outside for the summer and in August it will produce its vermilion trumpet flowers on stout stems. Flowering a little later, rerines have delightful, glistening flowers in pink, red and white; they differ from many bulbs in that they need to be rested and kept dry in the summer. Begonia and gloxinia tubers may be started into growth in March for flowering in the summer. 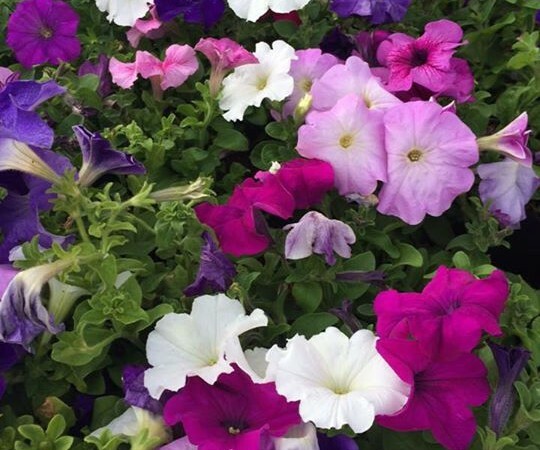 Achimenes can be treated similarly, grown in pots or in hanging baskets. Other flowers that will flourish in a greenhouse with a temperature of 50°F (10°C) in winter are perpetual-flowering carnations—they like light and airy conditions and will flower for most of the year; chrysanthemums for autumn and winter flowering; and fuchsias for the summer. Pot plants that can be raised from seed in spring and early summer for a display in winter and spring are: Primula obconica, P. malacoides and calceolarias. Some gardeners, unfortunately, are allergic to P. obconica and if they handle plants it sets up an unpleasant skin irritation. Cyclamen can be grown successfully from seed sown in August, to provide plants for flowering 16 months later. The poor man’s orchid, schizanthus, is also easily raised from seed in August for flowering the following spring. Regal pelargoniums are becoming more popular and they are useful for their handsome flowers borne from June onwards ; these are best propagated from cuttings taken in late summer. Fruit and vegetables Cucumbers and melons need a temperature no lower than 60°F (16°C) to grow well and it is not wise to make sowings before April. Tomatoes also need a temperature of 60°F (16°C) for a germination and seed should not be sown before early April in the cool greenhouse. Peaches and nectarines can be started into growth early with a little artificial heat but it is important to remember that the trees are given a rest in cool conditions in the winter. Suitable varieties are: peaches—`Early Rivers’, `Royal George’ and ‘Hales’s Early’ ; nectarines—`River’s Orange’ and ‘Early Rivers’. In a moderately heated greenhouse grape vines can be started into growth early and a little heat in early autumn helps to complete the ripening of the grapes. Suitable varieties are ‘Black Hamburgh’, ‘Foster’s Seedling’ and `Madresfield Court’. Given good light, lettuce is a useful winter crop in a moderately heated greenhouse. From a sowing in mid-October the seedlings are pricked out in boxes and planted in prepared beds in November; the lettuce should be ready for cutting in February. A suitable variety is `Cheshunt Early Giant’. In addition to those already mentioned, other vegetables and salad crops well worth growing in a cool greenhouse are mustard and cress, radishes and aubergines. Rhubarb and seakale can also be forced under the greenhouse staging in complete darkness. Warm greenhouses To be able to heat a greenhouse to a minimum temperature of 55°F (13°C) on the coldest night in winter is an expensive undertaking but it is also rewarding. A great many fascinating tropical or ‘stove’ plants can be cultivated in addition to those already mentioned. ShrubsAmong the shrubby plants with handsome foliage for a warm greenhouse, most of which are rarely seen, codiaeums (crotons) are outstanding. They have leaves of various shades, brightly marked with green, red, yellow and orange. Dracaenas also have attractively colored leaves and they include D. godseffiana with green, white-spotted leaves and D. fragrans victoriae with long green and yellow striped leaves. The poinsettia, Euphorbia pulcherrima, a popular plant at Christmas time with red rosettes of bracts, needs a warm greenhouse to grow well and so does its close relative E. fulgens, which has small orange-red flowers on arching stems in winter. Gardenias, which are prized for their pure white fragrant flowers, do best in a warm greenhouse. Less commonly seen is Brunfelsia calycina, an evergreen shrub with purple flowers. For training up the greenhouse roof there are numerous exotic climbers. The Madagascar jasmine, Stephanotis floribunda, has thick leathery leaves and clusters of white scented flowers. There are also several clerodendrums with colorful flowers; C. thompsoniae has crimson and white flowers and C. splendens produces clusters of red flowers. BulbsBegonias, gloxinias, hippeastrums and smithianthas can all be started into growth in January or early February; seed of begonias and gloxinias can also be sown in January. Apart from these popular types, Eucharis grandiflora with beautiful, white and fragrant flowers will revel in a warm greenhouse. The tuberose, Polianthus tuberosa, is another bulbous plant well worth cultivating for its white, fragrant flowers. Caladiums have tuberous roots and they are grown for their handsome foliage. The tubers can be started into growth after resting in the winter. Other plants that enjoy a warm greenhouse include coleus and Begonia rex, both of which have highly ornamental foliage. Winter-flowering begonias, provide a wonderful display of color in white, pink and red. Saintpaulias, so popular as room plants, do best in a well-heated greenhouse. Fruit and vegetablesMost of the kinds already mentioned can be grown in a warm greenhouse. Cucumbers and melons enjoy high temperatures and a humid atmosphere. Peaches and nectarines do not require high temperatures and the same applies to vines, although that very fine grape, ‘Muscat of Alexandra’, a tricky variety to grow, enjoys warmer conditions, particularly at flowering time and when the berries are ripening. Strawberries, put in pots in late summer will produce early fruit if they are gradually introduced into warmer conditions in February. ‘Royal Sovereign’ is a good variety for forcing. Figs are not often grown under glass but they can be cultivated in pots and, gradually given warmth in January and February, will produce ripe figs in late spring. With so many different forms of heating appliance available, it is often a little difficult for the amateur to make an easy selection or decision. The three main types of heating are electricity, solid fuel and oil. Each has its own particular merits and drawbacks. The final decision as to the best type to use can be simplified if certain points are carefully considered. The first must be the amount of money which is available, not only for the initial purchase but the running of the apparatus afterwards. Oil The cheapest to purchase and maintain is the paraffin oil burner. Many different types are available, from the very small model which could be used for heating a frame, to the large types which are quite capable of keeping the temperature inside big greenhouses (6m by 3m [20ft by 10ft]) well above freezing point. Whilst there are some very good models available, there are some which are very cheap and poorly made. It is very important that the purchase of an oil heater is made only from a specialist firm who use good quality metal and provide a suitable burner or wick. The best type of heater incorporates a blue-flame burner which, if properly trimmed and used with a high grade oil, should burn without causing fume damage to plants inside the greenhouse. There is a range of excel] ent heaters manufactured from solid, hand-rolled copper. These should provide many years of faithful service and will not corrode. The correct burning of an oil heater depends on the amount of oxygen it receives. If a greenhouse is completely shut down it is quite possible that the burners will not receive sufficient air and consequently may produce fumes. A very small amount of air can be supplied if a ventilator is opened not more than 1cm (1 in) on the sheltered side of the greenhouse. It is also necessary to keep the wick trimmed regularly and a high-grade oil used. The positioning of the heater is important if the greatest benefit is to be gained. In a small house the heater can be placed at the far gable end, away from the door and on the central path. It is essential that the heater is placed on a level foundation so that the wick receives a regular amount of oil and also that the fuel gauge indicates accurately. In a larger house it will be necessary to place the heater in the center of the greenhouse and on the pathway. To maintain higher temperatures in the larger houses two heaters may have to be used, placing one a little way away from the plain gable end and the second one about halfway along the path. Avoid at all costs a direct draught to a heater as this could cause the flames to flare and set the apparatus on fire. Oil heaters demand regular attention to filling, wick trimming and adjusting. A heater should, be checked about 20 minutes after it has been lit, as it is quite possible that the flames will have increased a little from the first setting and it will be necessary to readjust their height. Oil heaters are invaluable in the garden shed where they will give frost protection to tubers (eg dahlias or potatoes), which have been placed there for winter storage. They also add considerably to your comfort when you are busy in the potting shed during the cold, early part of the season. It is now possible to provide a measure of automation to oil heaters by feeding fuel from a large drum by gravity to the heater’s supply tank via a length of pipe. The large drum can be placed outside the greenhouse and the feed pipe taken inside. Solid fuel This is a very popular system of heating a greenhouse: it provides the maximum amount of heat for a low consumption of fuel. Like the paraffin heater, however, it is necessary to attend to it regularly. Great advances have been made with designs and many labor-saving gadgets have been introduced. Although solid fuel boilers require stoking and cleaning, some of the latest are designed to burn unattended for 14 hours or more. Their fuel consumption, too, is surprisingly economical for the amount of heat generated. For a temperature of about 50°F (10°C) in an 3m by 2m (8ft by 6ft) greenhouse only 25kg (cwt) of fuel is required weekly. Built-in thermostats considerably improve the performance of solid fuel boilers. Smokeless zone restrictions do not affect the modern greenhouse solid fuel boilers as they can burn most of the recognized smokeless fuels. One problem that arises with these boilers is that of fuel storage. In large gardens it may be possible to allocate an area conveniently close to the boiler for a fuel dump. This enables you to buy in all the fuel you require for the winter period, often at reduced summer prices. The problem of room in the smaller gardens might be troublesome and you may have to have a standing order for fuel so that you receive small amounts regularly. The maintenance of solid fuel equipment is very easy as there are few parts which are liable to cause trouble or wear out. Everything about these systems is robust and the thermostatic controls are very strongly constructed and extremely simple. Pipes are made from steel or high duty aluminium. The pipe joints are easy to connect by means of special expansion joints which are simply bolted tight when in position. Pipes are usually fastened to the walls or sides of the greenhouse by means of special holders. In this way they occupy the minimum amount of room. Electricity Electrical heating scores heavily over other systems if complete automation is required. It is, however, one of the most expensive methods to install and run. Before any form of electric heating can be installed it is necessary to bring the supply of electricity to the greenhouse site. This can be costly if the greenhouse is situated some way away from the source of supply. When siting a new greenhouse it is important to bear this point in mind. There are two ways in which the supply can be brought to the greenhouse; by underground cable or overhead. The former is the best method as the cable is unobtrusive and safely out of harm’s way. Underground cable is specially protected against mechanical and chemical damage. It is expensive and should be installed where it cannot be damaged by garden tools. Usually the cable is buried beneath the lawn or close by a path. In certain districts it is permissible to take the mains cable overhead or against a wall, but you must seek the advice of the local electricity authority beforehand. Where maximum internal working room is important, tubular electrical heaters are ideal as they are fastened to the sides of the greenhouse. Banks of tubes can be quickly installed to maintain any desired temperature. Usually a hand-operated or preferably a rod-type thermostat should be wired to these heaters to ensure automatic and economic running. Fan heaters can be moved around and are extremely efficient in that they blow warmed air to all parts of the greenhouse. This system ensures that there are no cold corners in the greenhouse. During the summer months the heating elements can be switched off and the fan used for air circulation only. Most fan heaters have a thermostat built in and although not as sensitive as the rod type they ensure reasonable running costs. A fan heater should be placed near the door and at least 0.6m (2ft) away from the side or other obstructions. If there is the possibility of drips of water from the staging, the heater must be placed away from it. In a small greenhouse this type of heater may take up valuable working room, although it could be placed to one side while work is carried out. It is also necessary to make quite sure that there are no plants in the direct line of the hot air. Convector heaters draw air in at the base, warm it and send it out hot at the top. They take a little longer to heat up the greenhouse as their warmth is concentrated just round the unit. This heater should be situated at one end of the house if it is a small one, or towards the center of the larger ones. A great deal of expense can be saved if small areas of the greenhouse can be heated. This can be accomplished in several ways, one of which is to partition part of the greenhouse and install heating in it. This section can be used as an intensive propagation section. If a small cabinet is made, air heating cables can be installed. These are specially designed and can be connected to a thermostat to provide automatic running. Electric propagators are available in many sizes and these, too, are an ideal form of confined heating. Usually these propagators are made from easily cleaned fibreglass and the heating is supplied by a length of heating cable which in turn is connected to a control box and thermostat. High temperatures of 65-80°F (18-27°C) can be maintained easily and economically. References have been made in this article to thermostats. The inexpensive types are suitable for loads from 1200 to 2000 watts. They can be regulated to control temperatures between 35 and 75°F (2-24°C). These are hand operated models and are usually accurate to within 4-6°F. The rod types are more expensive but very much more accurate. Usually there is only a differential of 1°F. These models are capable of controlling loads up to 4000 watts. The temperature range is usually wider, 30-90°F. A thermostat must be used with any form of electric heating so that the equipment can be left unattended and running costs kept to a minimum. With the advent of central heating it is possible for the gardener to make use of the domestic supply if a lean-to greenhouse is purchased. The greenhouse can be placed against a warm sunny wall of the house and a radiator or two can be taken into the greenhouse from the domestic supply. It will be necessary to damp down the greenhouse floor frequently if the floor of the greenhouse is concrete. Central heating is a dry type of heat and a humid atmosphere must be provided to ensure a good growing condition for the contents. The garden frame is less effective than the greenhouse, but it can still be most useful and occupies less space and is considerably less expensive both to buy in the first place and to run. The protection which frames afford seeds and plants can be put to good use in several ways. A frame can be a safe harbour for tender plants during the wetter and colder winter months. Such shelter encourages quicker and earlier growth enabling the gardener to force certain crops out of season. Plants raised in the warmth of a greenhouse and intended for outdoor planting need to be inured gradually to more robust conditions and must, therefore, spend a little time in a frame where, by gradually admitting more air, cooler conditions obtain. This process is known as hardening off. Heating frames Frames are usually unheated but with the advent of safe electric warming cables it is quite easy to convert an unheated frame. The use of warmth in this way extends the versatility of the frame considerably and converts it into a miniature greenhouse. Propagating frames Another type of frame is the propagating model which is much smaller than the outdoor ones and is intended for use in the greenhouse on the staging. Most of the modern ones are manufactured from fibreglass and are compact in shape and attractive in appearance. To provide the essential germinating temperature, heat is supplied in the form of bottom heat. Special electric cables are used which are placed in a sand base. The more expensive models are equipped with sensitive rod thermostats which can be set to a wide range of temperatures. This ensures accurate, labor-saving use. Two or three sheets of glass are provided so that the top of the propagator can be covered. When necessary, the glass sheets can be opened to provide ventilation. The site for the frame It is very important to place the frame in the best possible position for good plant growth. Ideally, a frame should face south, but if this is not possible it must be situated where it is sheltered from cold prevailing winds and where it will receive the maximum amount of sunlight. A frame is an important adjunct to the greenhouse where it is used as a place to harden off plants which have been raised under glass. Used in this way, the frame should be placed as close as possible to the greenhouse so that the plants need not be carried far. The frame should be positioned on well-drained ground, never where water tends to lie. If it is to be used without a greenhouse and is to be heated, it is advisable to site it close to the electricity supply to minimize installation costs. Many of the modern frame designs are attractive and do not look unsightly placed close to the dwelling house. The soil and site for the frame need careful preparation. The area should be excavated to about 30-40cm (12-16in) deep and a 7-10cm (3-4in) layer of small rubble and weathered cinders incorporated. If the sub-soil is heavy, it should be broken up well beforehand with a fork. The remainder of the site should be refilled with a specially prepared compost. The various John Innes formulae are the best and can be made up at home or purchased ready mixed. The formula to be used will depend on whether the frame is required for seed raising or for the cultivation of plants to maturity. In a small frame it is a good idea to use seed boxes, pots or pans for the seed raising and to grow plants to maturity directly in the prepared frame. Frame gardening It is surprising what can be done in a frame with a little preliminary planning. It is excellent as a propagator for a large number of seedlings and cuttings. Seeds can be sown thinly broadcast in the frame soil, in neat rows, or in pots or boxes placed inside the frame. The time to start must depend on whether the frame is heated or not. If the frame is heated work can begin as early as mid-February; in an unheated frame it is better to delay until about mid to late March. The hardy and particularly the half-hardy annuals are ideal for frame sowings, to produce sturdy plants for planting out in the late spring and early summer. The following are worth a trial: salvias, nemesias, China aster, antirrhinums, stocks, lobelias, petunias and Phlox drummondii. Late spring sowings may be made of perennials ; polyanthus and delphiniums are especially good for this purpose. Polyanthus sown in March and delphiniums sown in May, potted on into 7-10cm (3-4in) pots make fine, sturdy plants for planting out into their flowering quarters in the autumn. Cuttings can be raised in a frame to provide a wide variety of flowers. Good examples are chrysanthemums and dahlias. Chrysanthemum cuttings will be available from February until late April, depending on whether the frame is heated or not. Dahlia tubers boxed up in late March will also produce abundant cuttings. Protection from frost is necessary and a heated frame is better for this type of work. The simplest possible way to aid and protect plants is to use cloches, in effect a kind of movable, unheated frame which is available in various shapes and materials, but is normally tent-like and made of glass or clear plastic. Cloches are designed to give protection and this feature can be made use of in several ways. During wet or cold weather the soil can be covered with cloches and kept dry and warm. This enables the gardener to sow or plant much earlier than usual. Protection from cold winds and low temperatures encourages earlier and quicker growth and many plants can be started several weeks earlier than normally. In the colder northern counties and elsewhere many valuable winter crops can be brought through severe conditions successfully. Cloches stood securely on edge or wrapped around tender, larger plants, afford protection from cold prevailing winds and will promote healthier growth. Two or three cloches placed together with their ends sealed with glass, make ideal propagators or miniature frames. If the larger type of cloche is used a number of seedlings can be raised in a comparatively small area. Cloches protect plants from bird damage. Many seedlings are attacked by birds, especially pigeons, in town gardens. Seedlings raised under cloches are given complete protection. Strawberries are not only forced earlier but are also kept in good condition by the glass. Plants grown to maturity under cloches, particularly flowers, are protected from weather damage, and the keen exhibitor will quickly appreciate this fact. Planning and preparation Cloche cultivation is an intensive form of gardening and from a small piece of ground a wide variety of produce can be gathered. Cloches are used in continuous rows or strips, which must be sealed at the ends by a sheet of glass, retained in position by a piece of cane or strong wire. The number of rows or strips which are used will depend on the amount of ground available. One of the best ways to use cloches is to lay down a double row on a 2m (6ft) wide strip of ground with a 10-16cm (4-6in) gap between the two cloche rows. This 2m (6ft) wide strip will also include a 0-6m (2ft) wide path. The rest of the cloche garden is marked out into several of these 2m (6ft) wide strips. If the plot is laid out in this way, the cloches will not have to be moved far when they are transferred from one crop to another. The basic system of cropping is as follows : a double row is planted or sown and covered with cloches. Later on the vacant double strip near them and separated by the 0.6m (2ft) wide path is sown or planted. The cloches from the first double strip are moved over to cover this newly cropped strip, leaving the decloched crop to mature in the open. As soon as this crop has been cleared, the ground is prepared and another crop sown or planted. In due course, the cloches on the second strip are moved back on to the first strip and the crop just de-cloched is either gathered or allowed to mature in the open. This to and fro movement keeps the cloches continually in use. It is possible to devise more ambitious cropping schemes which require more strips and rows of cloches. The intensiveness of cropping can be increased still further if intercropping is practised. This means the cultivation of a quick maturing crop in the same strip as a slower growing main crop. The former is gathered several weeks before the latter is ready. An example of this is the cultivation of a center row of sweet peas under a row of cloches, with a row of lettuce on either side of the peas. The lettuces grow rapidly and will be cleared before the sweet peas become tall. Hardy plants which crop in early spring. Sowings are made under cloches in late autumn and winter and are kept covered until early April. Half-hardy plants which are covered during April and May. Tender plants which require cloche coverage during the summer. Soil preparation Soil moisture must be conserved under cloches as the ground is covered for long periods and protection from rain and the higher temperatures produced under the cloches can cause rapid drying out. To combat this, as much humus material as possible is worked into the ground to act as a sponge which retains moisture for long periods. waste at a barrowload to 6m (6yd) of strip. The strips are marked out with a line and dug over as deeply as possible to ensure good drainage. As the strip is prepared the humus material is worked into the bottom of each short trench. Where soils are light, some additional peat should be worked into the top 7-10cm (3-4in). This is also done when a small cloche seed bed is prepared. Each year, at a convenient time in the planning of a new rotation system, the 0.6m (2ft) wide path should be dug over and used as part of a growing strip. In this way, over the years, a very rich area of cloche ground is maintained. Growing vegetables A week before sowing or planting takes place a well-balanced or general fertilizer is given at 85g (3oz) per sq m (sq yd). This is raked in thoroughly and the raking action will also break the soil down ready for sowing or planting. If cloches are placed over the prepared strips a week before sowing or planting takes place, the ground will be warmed slightly and will be maintained in a suitable condition despite bad weather. Beetroot For early supplies, a late February sowing is made in the south. For general sowings March is a suitable month. Small or large cloches are used depending on the number of rows required. Sow a single row under small cloches, three rows under larger ones, spacing these 16cm (6in) apart. All seed is sown as thinly as possible, about 2.5cm (tin) deep. Early thinning is necessary when seedlings can be handled easily. A later thinning is advised when roots the size of a golf ball are lifted. These are excellent for salads. Plants left in the rows are allowed to mature. ‘Detroit Selected’ and ‘Crimson Ball’ are suitable. Broad beans Seed is sown in mid November in the north and late January in the south. Tall cloches or additional height provided by special adaptors is necessary in late spring for frost protection to tall plants. Sow a double row in a 7cm (3in) deep, flat bottom drill which is 20cm (8in) wide. Space the seeds 20cm (8in) apart in staggered fashion. Two suitable varieties are `Aquadulce’ and `Early Long Pod’. Dwarf beans Three sowings can be made: mid March in the south, early April in the north and, for a late crop to be picked approximately in October a July sowing can be made. For all sowings the variety ‘Lightning’ is ideal. Seed is sown under the larger cloches in a double row in a flat 16cm (6in) wide trench, 5cm (2in) deep. Stagger seeds 20cm (8in) apart. If drying beans are required, haricots should be sown in mid April in all districts as above. A good variety to use is `Comtesse du Chambourd’. Runner beans In the south seed is sown in mid March and in late April in the north. Large barn cloches are used making a double row sowing with the rows 23cm (9in) apart. Seeds are placed 5cm (2in) deep and 20-25cm (8-10in) apart. As the plants are staked individually later on, the seeds are not staggered, but placed opposite each other. `Streamline’ and `Kelvedon Wonder’ are very reliable. Brussel sprouts Cloches are used solely as seed raisers to give plants a long growing period after an early start. Seed is sown thinly in shallow drills under one or more cloches. Young plants are pricked out later into another seed bed and finally planted lm (2-ft) apart each way in their permanent quarters. In the south a sowing can be made in late. January using varieties such as `Cambridge No. 1′ for early pickings and `Cambridge No. 5′ for late crops. A’s soon as conditions allow in the north a sowing can be made in February using `Cambridge No. 1′ or ‘The Wroxton’. Carrots Five sowings are made according to district. In the south early January will provide the first pickings if the variety ‘Primo’ is used. The earliest possible sowing date in the north is mid to late February with a variety such as ‘Early Nantes’. Gardeners in the south can make another sowing in February for a prolonged supply of the early ‘Primo’. For a late November supply of carrots in the north, an August sowing of ‘Primo’ is advised. The seedlings must be cloched in September before first frosts threaten. Late crops for southern gardeners are obtained if a September to October sowing is made using the varieties ‘Early Nantes’ or `Primo’. Large cloches should be used, and four or five rows can be accommodated. Thin sowing is necessary in 1cm (tin) deep drills space 10-13cm (4-5in) apart. Cauliflowers Three sowings can be made, using a cloche or two as a seed raiser. Early September for the north and late September for the south are the first sowing dates for early crops. Large cloches should be used so that three drills can be made. Sow thinly and thin later to 5cm (2in) apart. Plant out finally in March and April 2 feet apart each way. If very large cloches are available, some plants can be covered to maturity. A suitable variety for these sowings is `All The Year Round’. In the south a further sowing can be made in January and late in February for northern districts. In both instances plants are raised under a few cloches and finally planted out in outdoor beds. The same variety can be used. Cucumbers Frame and ridge types can be used. The former is hardier and cloche protection is necessary during early stages of growth only. Plants can be purchased and set out under cloches in late April or seed can be raised under a cloche in early April in the south and late April or early May in the north. Whichever method is adopted, plants are finally planted out lm (3ft) apart in a single row. For each plant a special site should be prepared, taking out a hole 0.3m (1ft) square and half filling it with old manure or composted vegetable waste. The remainder of the hole should be filled up with good soil, mixed with a little horticultural peat. Plants are trained in a special way. When the fourth true leaf has formed, the growing point of the plant is removed. Several lateral growths should form and the two strongest are selected; the others removed. These two are trained to run along the direction of the cloche row, one on either side of the plant. When these growths have produced six leaves, they are stopped. Side growths should form on the laterals and it is on these that the fruit is carried. All side growths are stopped at the third leaf beyond a fruit. Growths not bearing fruit are stopped at the sixth leaf. All male flowers must be removed regularly from plants, otherwise fruits will be bitter and malformed. This applies only to the frame type of cucumber. Plenty of water is necessary and as soon as the first fruits have formed, weak liquid feeds or dry fertilizer should be given. Some light shading of the glass may be advisable in very warm, bright weather. Suitable varieties to use are ‘Conqueror’, ‘Improved Telegraph’, and ‘Butcher’s Disease Resisting’ which are frame types, and ‘Best of All Ridge’, ‘Greenline’ and ‘Long Green’ which are ridge cucumbers. Endive This is a useful crop which replaces lettuce in districts where lettuce cultivation is not very successful. In the south an early June sowing is ideal and later that month in northern gardens. Two rows are sown thinly under large barn cloches, spacing the rows 0.3m (1ft) apart and sowing the seed 1cm (2in) deep. Seedlings are thinned eventually to 0.3m (1ft) apart. The crop is covered in early September to protect from early frosts. The plants must be blanched or whitened. This is easily done if a flat object such as an inverted plate or saucer is placed over the center of each plant. In about six weeks the leaves will have blanched sufficiently. The best variety is `Round-leaved Batavian’. Lettuce Late September is the sowing time in all districts for lettuce which will be ready for cutting from approximately March to May. Large barn cloches are used to accommodate three rows of seeds. Sow thinly and thin in November to 25cm (10in) apart. Cloches remain over until April or late May in colder districts. Suitable varieties are ‘Attraction’ and ‘May King’. In late January a further sowing can be made in southern counties. These lettuce should be ready for cutting in June. Similar growing techniques are required except that the original sowing must be even thinner to minimize thinning or transplanting checks. ‘May King’ and ‘Perpetual’ are good varieties. Northern gardeners should make a sowing in late March. When large enough to handle thin plants to 0.3m (1ft) apart. Cloches can be removed in early June when frost danger has passed. `Trocadero Improved’, ‘Wonderful’ and `Buttercrunch’ are ideal varieties. For a late November supply of lettuce in the north, a sowing can be made in late July. Thin plants to at least 0.3m (1ft) apart to allow plenty of air to circulate round plants in the dull months. Put cloches over the plants in early September’ May King’, ‘Market Favourite’ and `Attraction’ can be recommended. The most suitable time to sow cos lettuce in all districts is March. Cover immediately with cloches which are removed in early June. Two rows can be sown under a large barn cloche. Seedlings must be thinned to 0.3m (lft). A good variety to sow is ‘Giant White’. Marrow Sow in late April in the north and late March in the south. Culture is similar to that required for cucumbers except that the compact bush types are the best to grow. These require no stopping or training. To ensure a good set of fruit, hand pollination is advisable. The cloches are kept over the plants until early June. Suitable varieties are `Tender and True’, ‘Green or White Bush’ and ‘Courgette’. Peas For first sowings in the north, early October is the best month and southern sowings are carried out in November. The next sowing in the south is January and both north and south can sow again in March. Sow in 20cm (8in) wide flat drills, 5cm (2in) deep. The seed is scattered in staggered formation 5-7cm (2-3 in) apart each way in three rows. The cloches remain over the plants from early sowings until the foliage is practically touching the roof glass. The peas can be decloched in early April when seed is sown in March. Early training with small twigs or brushwood is essential for good growth. Plenty of water is required once the plants are well established from the spring onwards. Suitable varieties are ‘Meteor’ for the October or November sowings, Kelvedon Wonder’ for January sowings and `Laxton’s Superb’ for the March sowings. Radish This crop (like the lettuce and early carrots), is an ideal catch crop or intercrop. Out of season sowings are more valuable for cloche work and in the south sowings are made in late September and frequently from then onwards until late March. For northern gardeners, September and October are suitable months for late work and the end of February until late April for the early spring. Seed is sown thinly in shallow drills when used as a catch crop or broadcast under one or two cloches. The smaller cloches are particularly suitable for the latter purpose. Suitable varieties are ‘French Breakfast’ and ‘Scarlet Globe’. Sweet Corn This is one crop in particular which is grown more easily in this country with the aid of cloches. In the north a sowing can be made in early May, and in the south in the second or third week in April. Seed is sown in situ or where the plants are to grow to maturity. Sow seed 25cm (10in) apart in double rows spaced 0.3m (1ft) apart. Two seeds per station are sown, removing the weakest seedling later on. This crop should not be transplanted. When the foliage reaches the roof the crop can be decloched. Plenty of water is essential during hot, dry weather. There is no need to remove sidegrowths. A little soil should be drawn up on either side of the rows when the plants are about 1m (3ft) high. This helps to anchor them and is an essential part of their culture in exposed districts. The cobs are ripe when the grain inside the cobs exudes a milky fluid as they are squeezed with the finger nails. Suitable varieties are Fogwill’s Extra Early’, ‘Golden Bantam’ and ‘Canada Crop’. Tomatoes Outdoor tomatoes are usually a rather chancy crop in this country as a long spell of good weather is needed to get the bulk of the fruit ripened before frosts cut the plants down. Cloches have an invaluable part to play in the successful culture of this plant. They can either give the plants vital early protection so that they become established quickly or they can provide continuous protection which will produce crops nearly as early as glasshouse ones. Northern gardeners will welcome this type of protection in districts which are much colder. The site for the crop should be prepared thoroughly by deep cultivation. Separate positions can be prepared for each plant as for cucumbers and marrows. A general fertilizer is applied a few days before planting at 84g (3oz) per sq m (sq yd). The plants are best purchased from a reliable source. Good plants are short jointed and deep green in color. The plants should be set out 0.6m (2ft) apart in the row, with 1m (3ft) between each row. sideshoots must be removed from cordon plants as soon as they are noticed. In early June, it will be safe enough in all districts to remove the cloches entirely except where it is intended to grow to maturity under them. Plenty of water must be given, especially when the first flower trusses have set. Dry or weak liquid feeds will be required to encourage heavy trusses of fruit. When cordon plants have produced four trusses, they should be stopped. This is done by removing the center or growing point of the plants. Bush tomatoes require no stopping or side shooting. Several varieties can be grownout of doors. Of the cordons, ‘Outdoor Girl’ and ‘Essex Wonder’ are excellent. There are several very good bushvarieties. These include ‘Amateur Improved’, ‘Atom’ and ‘Dwarf Cloche’. Thelatter two varieties are exceptionally useful as they grow to a height and spread of only 37cm (15in). Flowers There are certain flowers which are particularly suited to cloche cultivation. These can be brought into bloom several weeks earlier and the quality of the flower is often much better. Hardy annuals, in particular, are ideal plants for cloche protection during the early stages of their growth. The most important of these are sweet peas. Sweet peas Sowing time for sweet peas in the north and south is late September. Seed can also be sown in March. The strip of ground should be deeply worked and plenty of organic matter incorporated in the form of peat, old manure or composted vegetable waste. Seed is sown one row per small cloche and two under the larger types. Space the seeds 16cm (6in) apart in the rows. Cloches must be placed over the rows as soon as the seed is sown in the north. Southern sowings need not be covered until early October. As soon as the plants are 10-13cm (3-4in) high, they should be provided with pieces of brushwood, through which they will grow. If large flowers are required, plants should be grown in the cordon system. Only the strongest side-growth is allowed to grow on after the initial stopping, and this growth should be trained up a strong cane. Plenty of water is required during the summer. There are so many beautiful, reliable varieties that a selection should be made from a specialist’s catalogue. Other hardy annuals Those suitable for cloche work and autumn sowing include calendula, candytuft, cornflower, scabious, viscaria, sweet sultan and nigella. For spring sowing the following are recommended godetia, mignonette and clarkia. Seed is sown in groups as thinly as possible or in single rows. Large cloches can accommodate two rows. Fruit There are two outstanding cloche crops, strawberries and melons. Strawberries can be harvested several weeks before outdoor fruits are ready; cloches provide sufficient protection for melons to produce delicious fruits as good as those grown in greenhouses. Strawberries The site should be dug over thoroughly to ensure good drainage and organic matter incorporated at the same time at approximately a barrow-load to 8 sq m (8 sq yd). A few days before planting apply a balanced or general fertilizer at 84g (3oz) per sq m (sq yd). A bed is started by the purchase of one year old plants of virus free stock, which are planted in two rows 0.3m (1ft) apart with 0.3m (1ft) between plants. Early August is a suitable planting time and cloches are placed over the plants in late October in the north and late November in the south. Cloches are kept over the plants until picking is over. This protection will keep fruits in perfect condition and will prevent bird damage. During warmer weather in March and April, a little ventilation, will be necessary. In the second year the second row of plants should be scrapped as two year old plants grow quite large under cloches. If new plants are required, they can be propagated by runners from a healthy parent plant. Varieties to use are ‘Cambridge vigor’ and ‘Cambridge Favourite’. Melons Although this crop can be attempted in the north, it is more suited to the warmer southern regions. Melons are gross feeders and should have plenty of well-rotted manure or composted vegetable waste worked in at a barrowload to 6 sq m (6 sq yd). Horticultural peat at 0.25kg (1/2 lb) per sq m (sq yd) should be forked into the top 7-10cm (3-4in) of soil. To conserve manure or compost, individual positions 46m (58in) square can be prepared. These are spaced 1m (3ft) apart in a single row. Plants can be raised from seed if a greenhouse or propagator is available where a temperature of 60°F (16°C) can be maintained. Failing this, plants can be purchased from a reliable source. Planting is done in mid May in pre-warmed ground. Plants should be covered with large barn type cloches. A special training system is necessary as follows : stop plants after they have developed five true leaves. Select two of the strongest laterals which will be produced and remove all others. Train these laterals on either side of the plant in the direction of the cloche run. When they are about 0.6m (2ft) long, stop them. Sub-laterals will form and it is on these that the fruits will be carried. Hand pollination of female flowers is essential and a small paint brush is ideal for this work. As fertilized fruits swell, give plenty of water and weak liquid feeds. Allow two or three fruits per plant and place these on sheets of glass or blocks of wood to prevent damage. As the fruit ripens reduce water. Glass should be shaded and a very light spray with Summer Cloud will be ideal. Suitable varieties are ‘Large Rock Prescott’, ‘Tiger’, ‘Best of All’ and `Cantaloup Charantais’. A cropping plan The following is a cropping plan for one row of barn cloches used on the two strip system. The crops are easy to grow and will provide a wide range of vegetables. Conservatories really include lean-to greenhouses, glass corridors and perhaps glass-covered courtyards. They are joined to the house and can contain a variety of pot and climbing plants for all-the-year-round decoration. Conservatories of reasonable size are not expensive to build. They are easy to look after, and give remarkable scope for the gardener to grow a variety of hardy and not so hardy plants. Near-greenhouse conditions, ideal for growing and rejuvenation, can easily be arranged by installing simple heating systems. Sometimes, in the warmer, more southerly parts of the country or where the conservatory has a warm aspect in a sheltered position, the heat circulating from the house is sufficient. A solid floor makes it possible to keep a thriving, humid atmosphere by the simple means of damping down. Heat without humidity can be fatal to plants moist, warm conditions help to keep most of them at the peak of condition. Where there is staging to stand the pots on, it should be strong enough to carry a layer of shingle. Strictly speaking, conservatories are display houses for plants which have been raised and grown elsewhere, though there is not the slightest reason why the conservatory should not be pressed into service for simple propagation and other jobs for which an ordinary greenhouse might be used. The only trouble is that used in this way, clutter can spoil the effect. Conservatory plants Greenhouse plants which enjoy temperate conditions thrive in conservatories. These include cinerarias, coleus various primulas such as P. obconica and P. malacoides, the very showy greenhouse calceolarias such as the ‘Albert Kent Hybrids’, C. multiflora nana and ‘Victoria Prize’. Cyclamen, many begonias, certainly many of the highly ornamental, scented-leaved pelargoniums can be grown as well as a wide range of cacti and other succulents. In fact by careful selection and sensible control of heating and other conditions, there need seldom be a time when there is nothing of color or interest to see. Annuals in pots should not be overlooked; delightful annuals such as schizanthus, mignonette, salpiglossis, clarkia and calendula. Hanging baskets, which might otherwise be buffeted about can find true expression in a conservatory where there is room to avoid collision. Ordinary hanging basket plants, lobelia, tagetes, nasturtiums, geraniums and fuchsias and so on, will thrive to perfection, provided extra attention is paid to watering. Fuchsias and pelargoniums, of course, can be used as individual displays throughout the staging. Hoya bella and Hoya carnosa are two plants which will permanently occupy a hanging basket with great success. And if a little extra care is taken, a warm corner might well see Columnea gloriosa doing quite well, though strictly speaking this does prefer rather warmer conditions than a conservatory can usually provide. The two hoyas, despite their somewhat exotic appearance, are really quite hard-wearing and will even endure ordinary living room conditions if they have to ; though every living room is not always quite right. A place will have to be found for various ferns. A shady spot, perhaps, beneath the staging. There is considerable scope for climbing plants. Where there is sufficient room, the passion flower—Passifloracaerulea—can hardly be left out. Cobaea scandens has great attraction, and with just that extra warmth and protection that the conservatory can provide, here is a fine chance to grow the deliciously fragrant Jasminum polyanthum with its large trusses of dainty white blossom. So many of the plants suitable for these under-cover conditions (both annual and perennial) grow well enough outside in the garden, as will have been recognized, but afforded just that extra welcome offered by the conservatory they can realize a potential that, subjected to the weather, especially in a bad season, they could possibly never know. And many pot plants traditionally suited to the rough justice handed out by the ordinary living room, will nevertheless make an even better showing in more controlled conditions. A wide range of bulbs come into the reckoning, not least some of the hardy kinds to be brought on early. Given warmth and light after the statutory period of cool and dark elsewhere (and it is very useful all round if a conservatory can be run in conjunction with cold frames) varieties of daffodils and narcissi, for example, will achieve early perfection not always resulting from ordinary room culture. Site the conservatory south, if possible, though this is not essential. Allow adequate means for ventilation—efficiency here is vital—and provide watering facilities in situ if this can reasonably be arranged.